The Yas Marina circuit in Abu Dhabi offers lavish stays at the best hotels with premium and exotic dining options available. VIP facilities, lounges and concerts are all a part of this 3-day experience. There are ample of choices to select from. Book your entire trip at TravelDecorum’s website and choose from the best. There are three F1 Abu Dhabi packages available to choose from General, Deluxe and Super Deluxe. A choice of full weekend South, Marina, North or West Grandstand tickets are included. 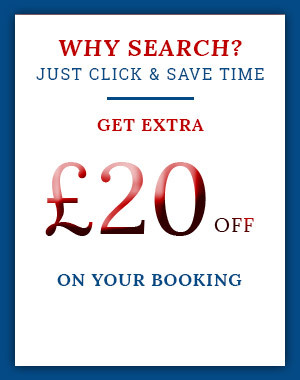 This includes your return flights, hotel stay, tickets to the race and post race concerts and events. This package also has private transfers included. .
Apart from all the facilities in the General package, the hotel stay is more plush and a step above. Why not upgrade to our Deluxe Package, add a 5 star accomodation to your holiday which is only a short distance from the Yas Marina Circuit. 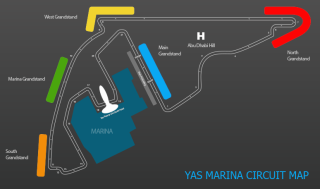 Al Dhiyafa Hospitality tickets + SUV Car hire throughout the travel + free parking at the race. Luxury personified in a package! Business class tickets, five star accommodation and SUV car hire throughout the travel apart from all the perks of the base package. Travel Decorum offers the following entry tickets as part of various packages available on the website. Customize your F1 package according to your whims and fancies! Yas suites, earlier known as Al Dhiyafa, is the plush accommodation that will help all sports enthusiasts enjoy the race like a VIP. The air-conditioned suite with sumptuous food and never-ending beverages on the house is what you have been looking for to see the breathtaking Grand Prix race in Abu Dhabi. Choose your package on the Travel Decorum website according to the number of days you will be booking it for. Wine, F1 racecars and sheer opulence, welcome to the Grand Prix Abu Dhabi! Announced in 2007 at the first ever F1 festival, there has been no looking back. With the extravagant city supporting this popular sport, the day-night Grand Prix races here are a spectacle. Till now, Abu Dhabi has hosted 10 races, with Lewis Hamilton winning it 4 times and Mercedes being the top car constructor to win it 5 times. This is an alluring day to night switch race. The Grand Prix’s 55 laps show is pure bliss to the eyes witnessing history being created. 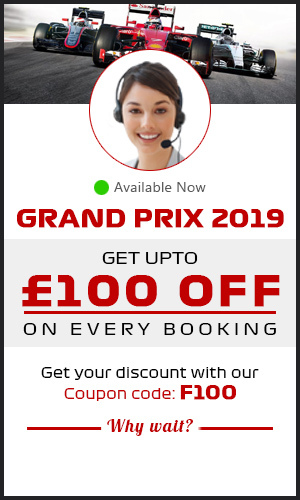 PRE-REGISTER FOR THE 2019 FORMULA 1 ETIHAD AIRWAYS ABU DHABI GRAND PRIX. Abu Dhabi International Airport (AUH) is the main airport used for all international air transfers to Abu Dhabi. It is located 19 miles east of the Abu Dhabi city. It has 4 terminals used for flight services and is equipped with 2 parallel runways. Etihad Airways is the dominant airlines using this airport as its hub. Travel time from London to Abu Dhabi: 8 hours. Travel time from Manchester to Abu Dhabi: 6 hours 55 minutes. Travel time from Edinburgh to Abu Dhabi: 9 hours 35 minutes (1+ stop). Largest mosque in the country, experience the beauty of daily prayers and Muslim culture. Have a lavish lunch and hi-tea at this landmark five star hotel in Abu Dhabi. Bundle up in the lap of luxury. It is the first Ferrari themed indoor amusement park in Yas Island. It is a must-visit for all sports enthusiasts. Book a desert safari and enjoy other activities such as desert biking and camel riding. At Travel Decorum’s website you can customize all aspects of your F1 travel, be it flights, accommodation, tickets, car hires and after race gigs. All options can be altered to cater to your wants. Give us a call and lets get you started on this adventure!